I love this quilt. My summer project is going to be matching Pow-Wow quilts for the beds of my boys. My inspiration for this quilt came from this stamp set I saw in the fall…sometimes inspiration comes from strange places! The cover quilt is a Throw size… with a good chunk of the fabrics from the Denyse Schmidt line at Joanns and some others. The Pow Wow pattern can be found here as a PDF, or here as a Paper pattern in my shop. Genius! All your new patterns are beautiful! 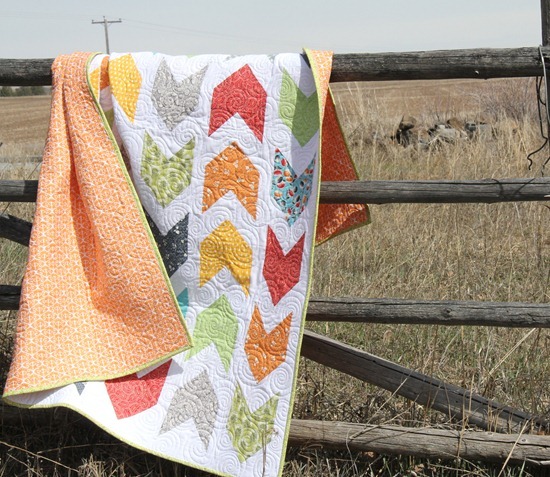 Love the quilt and the quilting–that's the direction I need to stretch in! Love the quilt! And the photo of it hanging over those weathered boards is just beautiful! Bought Spin Cycle last night and can't wait to start it! Love Pow Wow too! These are some great patterns Allison. Lovely quilt! I love the pattern it's such a great idea:) I like the way you hung it up to take a photo of it, it's really pretty against the background. I can't decide which I love more, the pattern or the quilting! I can see how you saw a quilt in that rubber stamp display. Your quilt looks wonderful! I absolutely LOVE this pattern. The fabrics you used for the sample are gorgeous. Fantastic project!! I too love this quilt!I also think your other new patterns are wonderful! Now which pattern should I order? Decisions! Decisions! What a great pattern! And I LOVE that it has size options. Can't decide between this one and Spin Cycle. I really heart the backing fabric. Gorgeous! I'm thinking my son might need this on his bed too :-). Great job…again! I love it too! It reminds me of the tribal designs that are in this season for clothing and shoes! 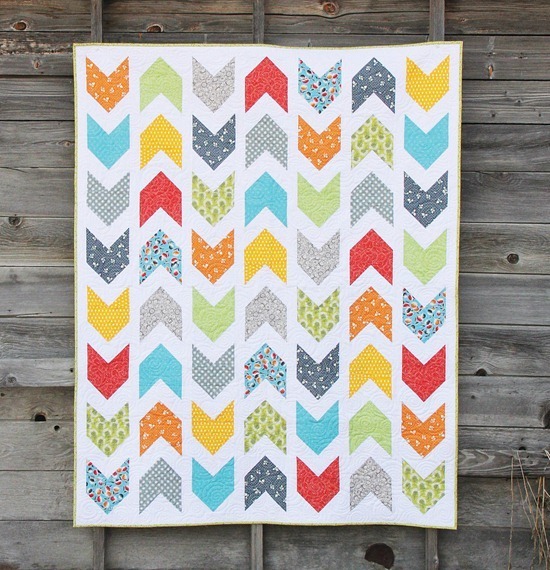 This is a great quilt–as are your other new patterns. I love the background fabric used on Pow-Wow. I love them all, Allison! Are you going to market this spring?? So pretty! I have a daughter-in-law who is absolutely crazy about this quilt, so I am going to help her put one together soon. I especially like the white background. Just makes the colors pop. I love it!! What is that great orange backing fabric? You are the best at giving size options in your patterns. Seriously some major added-value there. I really really appreciate that. I love this quilt and how well it would be awesome for a little boy's quilt! And thanks for the coupon code – I will definitely be purchasing this pattern. I like this pattern it looks graphic and fresh. It seems versatile as well, I can see it done with solid or patterned fabrics and it would look good. Great job! Such a cute pattern. I am making one with the Comma fabric and just started cutting it out. Can't wait to see it all made up. Thanks! I love this quilt! 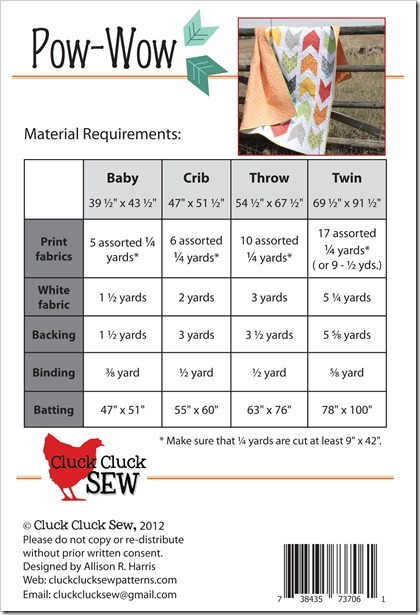 Does the crib size shrink down the measurements so that the arrows are still 7 across and 8 down?